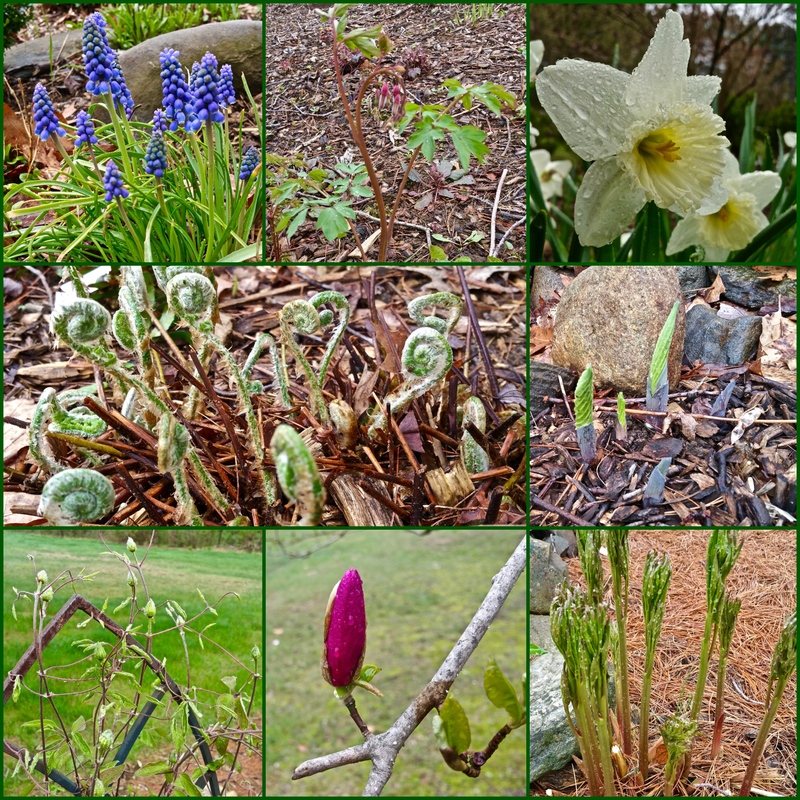 This entry was posted in Photography, Wordless Wednesday and tagged Bleeding hearts, Christmas Fern, Daffodils, Flowers, Gardening, Grape Hyacinths, New England, New Hampshire, Peony, Photography, Solomon's Seal, Spring, Tulip Tree, Wordless Wednesday. Bookmark the permalink. What latitude are you on, Judy? It looks like your garden and ours are at just the same stage–all kinds of promise (but chilly and overcast here, too)! We’re at 44.41, so it’s very close. We are way behind on outside work for the same reasons–the ground is saturated! Things are growing, though! Brr! Love the fern heads unfolding. Glad to see your garden is growing! I planted bleeding heart seeds about 3 weeks ago and they haven’t sprouted yet. Do they just take a long time to sprout? I have more seeds so should I try again? I’ve never tried Bleeding Hearts from seeds. I’ve only purchased plants. So, I did a little research, and it looks quite different than annuals. There are articles on doing it in the fall or soaking and sprouting in a refrigerator. Looks like they need some cold temps to sprout. Judy, thank you for looking into it for me! I have never heard of a tulip tree. How great is that!! And the Christmas fern looks like a plant of Walt Disney snails!! My bleeding heart is growing by leaps and bounds. Why not? Rain, rain and more rain. Is grass supposed to “squish” when you walk on it? Lol. Only hitting 50’s today and 32 tonight. Yes, FREEZING! We had to turn heat on this morning. That’s just not right!! Your beautiful plants bring hope of warm, sunny days to come. Beautiful! After 3 days of nonstop rain, I see hosta leaves poking up and that is so encouraging! A beautiful collage of what’s growing in your garden. I looked at your flowers and picked up my camera. It’s not a beautiful day here. Overcast and thinking about rain (again), but it ISN’T raining, yet. You inspired me. Turns out, over the past few days of nonstop rain, there has also been much blooming. I’m glad you inspired me! Oh, yes, we know about The Squish here in Indiana. Apparently we’re headed into the 30s over the weekend, so I don’t even want to think what that means for you! Your photos are lovely, and most uplifting on this November day in May. Looks like spring (if you ignore that chilly wind)! I’m not sure what variety you grow, but your clematis looks way ahead of mine just ‘a couple of towns over.’ Do you cut it back at season’s end? Oh, wow, things are getting ready to pop in your collage! It’s so good to see growing things again, isn’t it? We are about at the same stage as you. Still very soggy here, though. Ahhh Judy – your green thumb makes me green with envy! I have been a plant killer as long as I can remember. But your beautiful results motivate me to keep trying!!! I’m loving all these spring flowers – beautiful! I missed your post last week, … but envious of your lovely spring flowers coming up! Nature has awakened, appeared new growths, the greenness instead of brown. I love your vernal flowers, Judy!